The ruins of Roman colonies lay scattered around the world, and while time and erosion have worn them down, they continue to be fantastic tourist destinations. 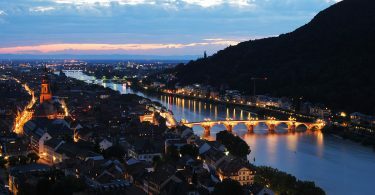 Of course, the city of Rome may be host to some of the most seen and recognized ruins, but travelers owe it to themselves to step off the beaten path and experience untouched marvels. For this, look no further than Algeria! 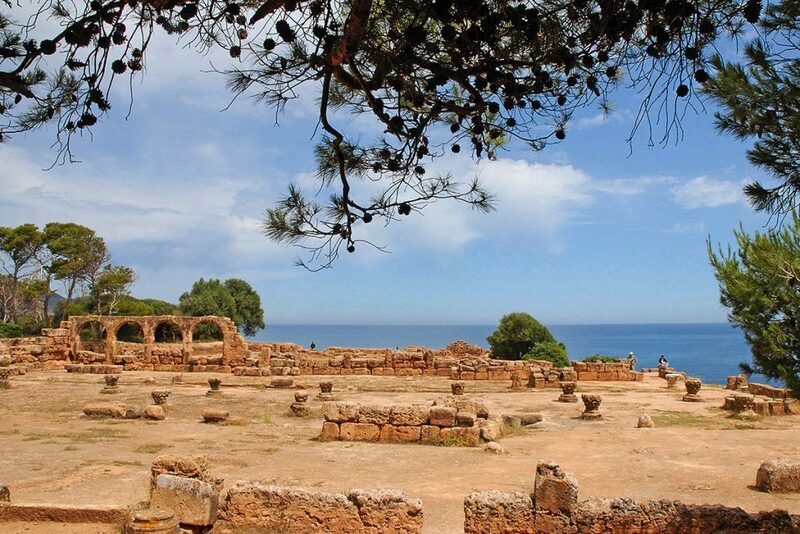 With ancient Roman ruins on rolling hills, beaches, and beyond, visitors can experience these ancient pockets of civilization. 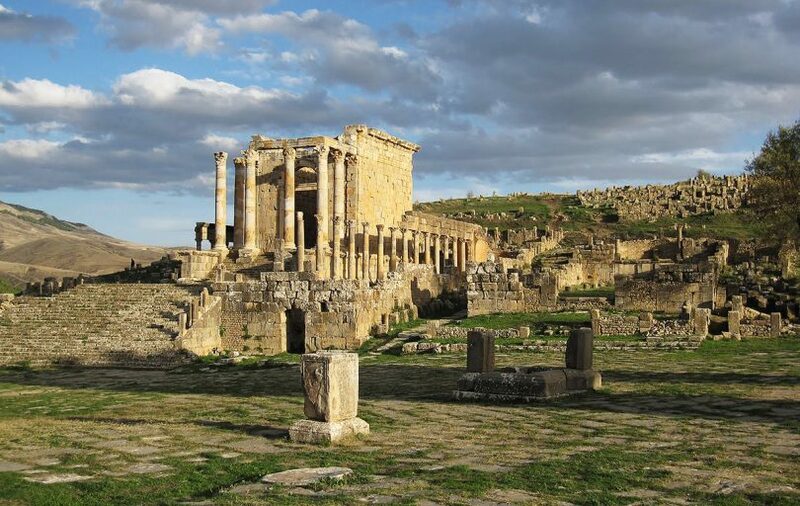 Standing since 100 AD, Timgad rests in the Aures Mountains. 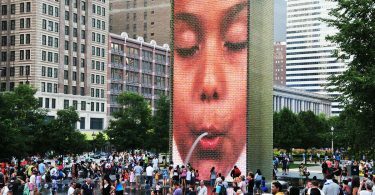 One of the major achievements here is the early use of grid planning which still exists today in cities like New York. While many Roman settlements also used this type of city planning, Timgad is one of the largest intact areas that allows visitors to comprehend just how great an achievement it is. Many of these buildings were originally produced with grand stone; today, the ruins remain strong yet burnt against the Sahara sun. While one can see traces of the ancient library, marvelous pillars, and rows of housing, the most amazing aspect of it all is witnessing a true fossil of a once thriving civilization. 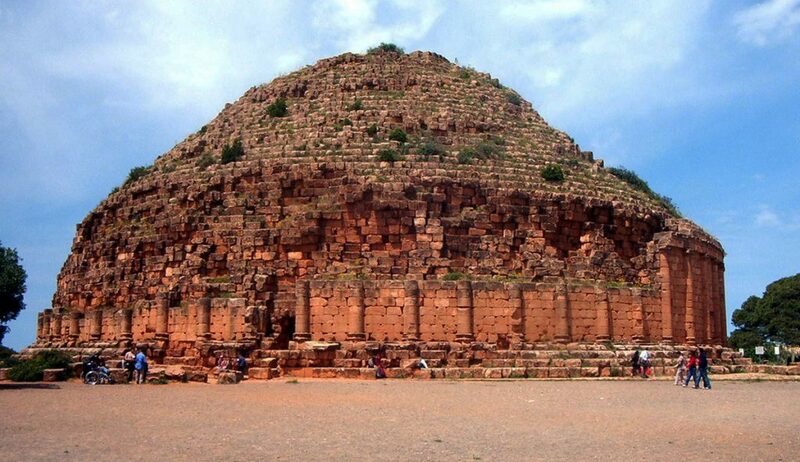 Timgad is historical travel at its greatest! Getting there: Buses run from nearby Batna, or you can hire a private car to make the 45 minute drive. In stark contrast to Timgad’s barren plains, Tipasa is a beachfront settlement that offers ancient ruins alongside idyllic warm sand beaches. Originally used as a trading post and military colony by the Roman Empire, Tipasa eventually became somewhat of a normal city while still under Roman rule in the fourth century. Featuring at least three basilicas, the city was eventually leveled by the Vandals leaving it in ruin for at least 100 years. Around 530 AD, the Byzantines attempted to recreate the city’s vast and spiritual reverence, but by the mid 700’s, the city was again sacked, this time by the Arabs. Now, these final ruins lay at rest under UNESCO protection to allow visitors the chance to see history in a surprisingly colorful paradise. Tipasa is one of the few destinations where a history book is allowed at the beach! This would be a great place to find a hotel in Tipasa and spend a few days relaxing. The Royal Mausoleum of Mauretania may not be as vast as the other ruins on this list, but it is equally important and fascinating. The monument rests at the end of a road between Algiers and Cherchell, and while the stone facade and pillars may appear extremely worn, it’s only because this giant tomb has been standing since 3 BC. It contains the remains of the King of Mauretania, Juba II, along with his wife Cleopatra Selene II of Egypt. Some historians believe that this tomb lay the blueprint for the tomb of Augustus, the first Roman Emperor. Today, travelers are lucky to catch a glimpse of this extremely ancient monument. As if time were not cruel enough, the monument was also under attack by French and Arab armies, who occasionally used the site as target practice. Today, it stands rugged and tall to give a glimpse into an ancient world. Djémila, called Cuicul in Roman times, is one of the most exotic ruins on the list, and it’s not just because of the countless arches, churches, and even full streets left behind. 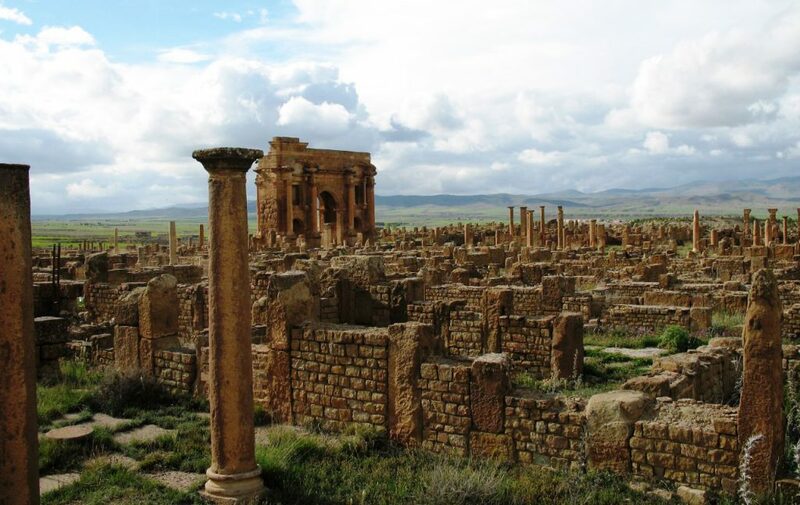 Djémila remains an exotic and perplexing area because it features ancient Roman architecture resting on vast sloping hills in northern Algeria. Unlike most ruins, this city was not continuously sacked throughout the years, and even the later Arab conquerors named it “Beautiful.” Visitors can find a wonderfully preserved theater, forum, the Arch of Caracalla, and other prime examples of Roman architecture featured elegantly along the sweeping hills of a forgotten region. Getting there: the easiest route is by private car or taxi, about an hour ride from nearby Setif. Madauros’ ruins may be more rugged than others, but they are equally as beautiful. The town became a colony right before the second century, and it gave way to many artists and thinkers throughout the Roman Empire. While many of the buildings lay in ruins after Arab conquests in the 7th century, visitors can find rustic glimpses of basilicas, theaters, statues, and Latin inscribed epitaphs. Madauros is not the grandest ruin site, and it doesn’t feature the breathtaking nature of Tipasa, but it still provides a cultural punch for those with historical wanderlust. Getting there: As with most other ruins, we suggest hiring a private car or taxi. The larger city of Constantine is about 2.5 hours from the Madauros ruins. 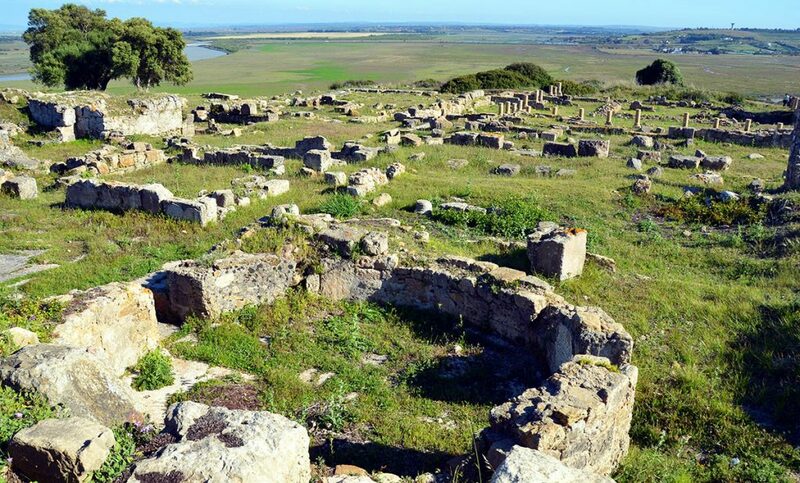 While these may be the top ruins in Algeria, there are countless areas scattered throughout the country!